BounceU was established by parents like you, and all of our facilities and programs are designed to be safe, upbeat, and truly memorable. We understand you're too busy to worry about planning and that you want your kids to feel like the center of attention. 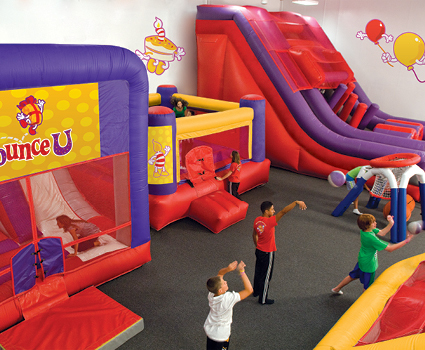 We know you'd like your inflatable parties to be unique, exhilarating, and stress-free. That's why we're one of the very best party places for kids! Scott & Julie Hamilton, residents of the Charlotte area for over a decade, opened BounceU of Charlotte in June of 2008. BounceU started out of a love for kids, and truth be told, we’re all still young at heart! Scott & Julie have four sons together and that’s why they created the funnest, most happiest private party place in the universe, for their kids as well as yours. They wanted a private party business they could be proud of, one that was safe for kids and enjoyable for parents too. We love to see families and friends just being themselves in a private-party environment, going a little wild, and sharing memories that will last a lifetime. Since 2008 Scott & Julie have consistently operated an outstanding business as evidenced by the many businesses that return to partner with BounceU. Some of the wonderful non-profits BounceU has partnered with include: Make-A-Wish Foundation, American Heart Association, Second Harvest Food Bank, Solace for the Children, and The Relatives Youth Crisis Center. Not only do the Hamilton’s live, work, attend school, and frequent many businesses in the Charlotte area, several amazing local organizations frequent BounceU too, including: After School Construction Zone, Gateway Academy, King Tiger Tae Kwan Do, Goddard School of Lake Norman, Lake Norman YMCA, McCrorey YMCA, Fairview United Methodist Church, Hickory Grove Baptist Church, Mallard Creek Presbyterian, Kidz R Kidz, University Child Development Center, West Gastonia Girls & Boys Club, Second Baptist Daycare, just to name a few. Also, we currently sponsor the Bronco Division Durham Bulls Baseball team at the Mallard Creek Optimist Club. Click on testimonials to continue reading. We are proud to serve families in the Charlotte, Matthews, Mint Hill, Monroe, Southpark, Weddington, Indian Trail, and surrounding areas. We hope to see you at BounceU! We go out of our way to make your child feel SUPER special on their bestest day ever! Our SUPER STAR service is what makes a birthday party at BounceU just as awesome and stress-free for parents as it is fun for the kids. 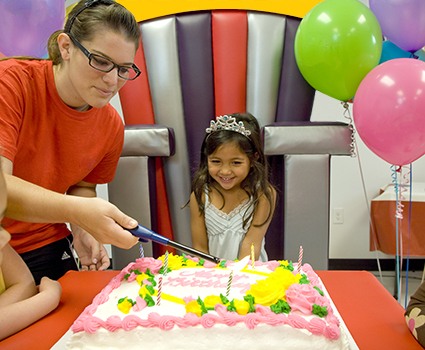 Our specially trained Party Pros are the birthday party experts, and specialize in treating the birthday child like a VIP!